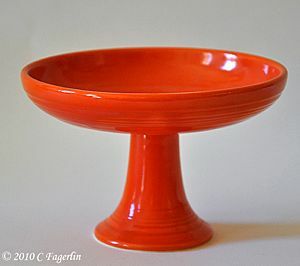 appropriate for Vintage Thingies Thursday over at Coloradolady too! 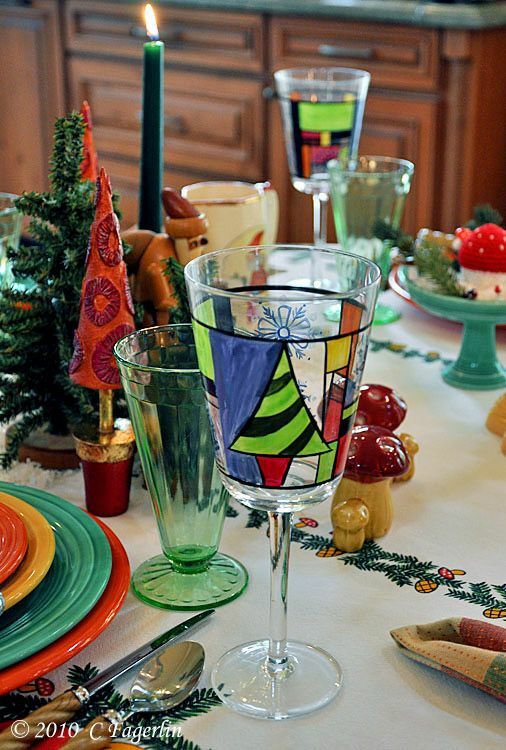 Classic European holiday motifs adorn the tablecloth topped with vintage Fiesta dinnerware in Yellow, Green and Red. That classic "orange" Fiesta is actually called Red. 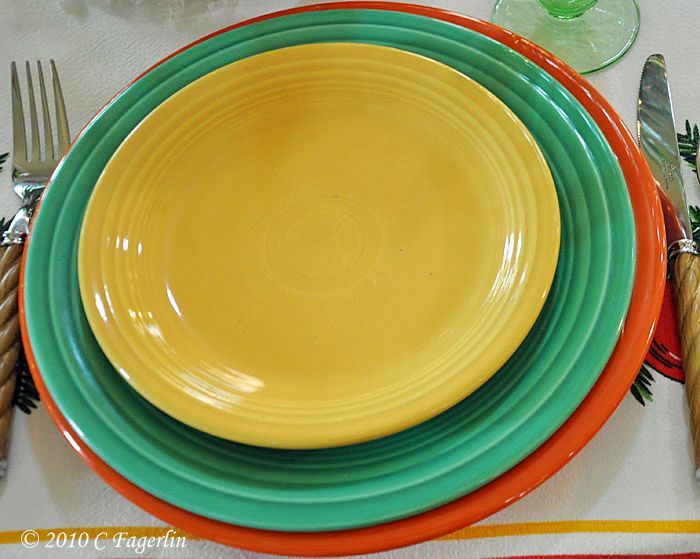 :-) The place setting consists of a dinner plate, luncheon plate, salad plate and bread/butter plate. 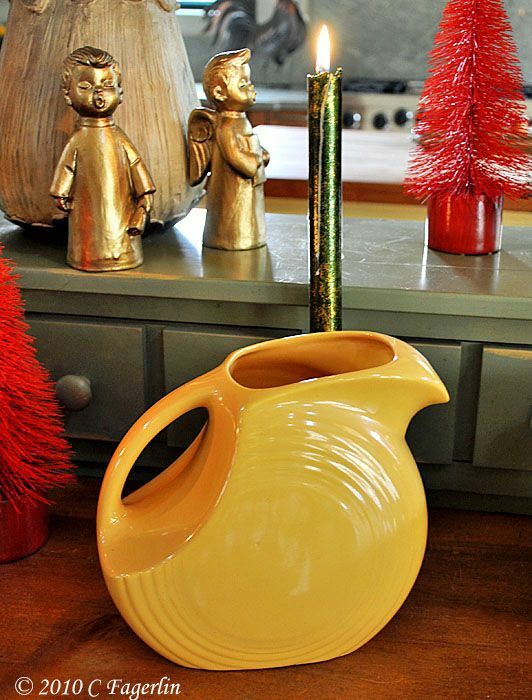 Yellow tripod candle holders, disc pitcher and coffee pot are also shown. 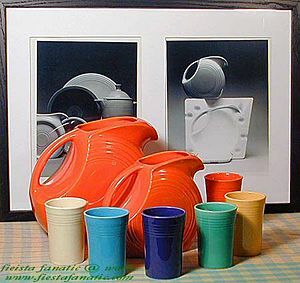 The two nested bowls between the disc pitcher and the coffee pot are the only contemporary Fiesta in these pictures. 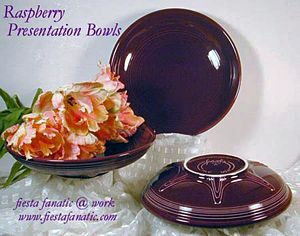 They are in the 75th Anniversary color Marigold and mimic the look and feel of the nested vintage Fiesta mixing bowls. 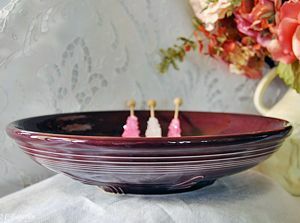 These are the two smallest, while three larger nested bowls comprise the "Baking Bowls." 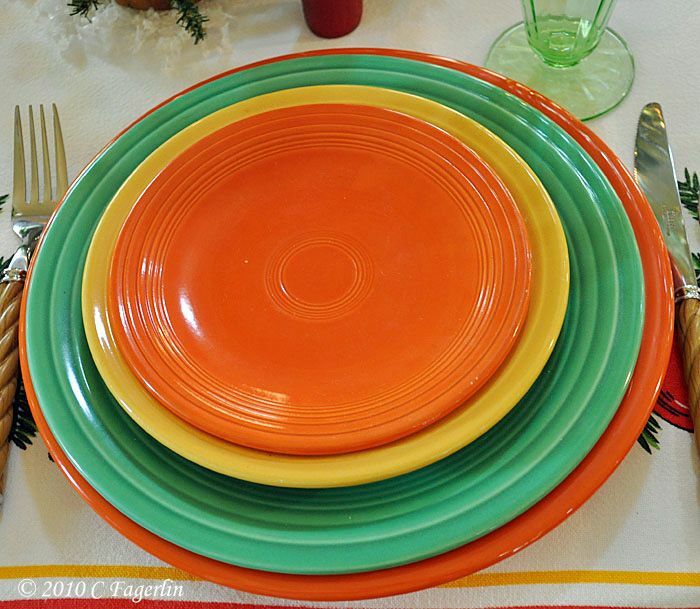 2011 will bring the anniversary color into its full release with the long awaited place settings and accessory pieces. 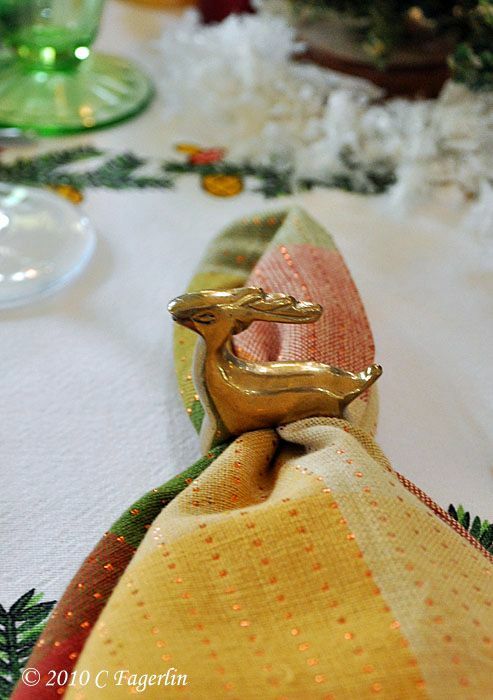 flatware is contemporary in a twisted rope pattern, napkins from Home Goods. 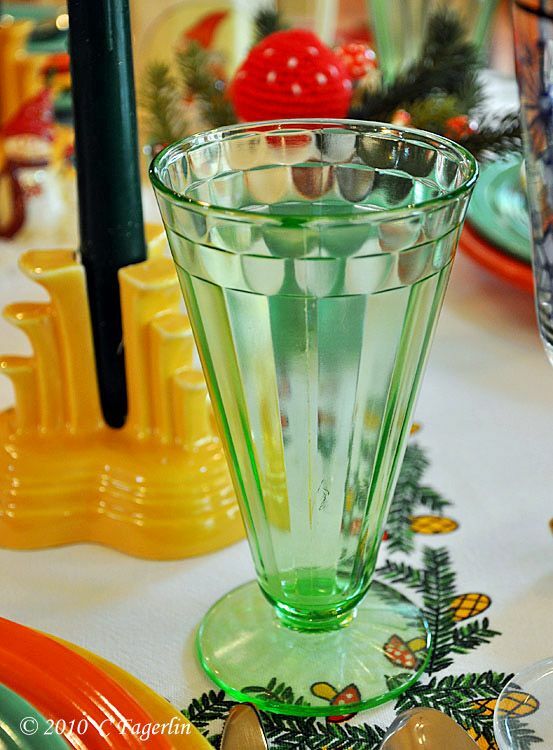 Pfaltzgraff goblets above and vintage depression glass below. 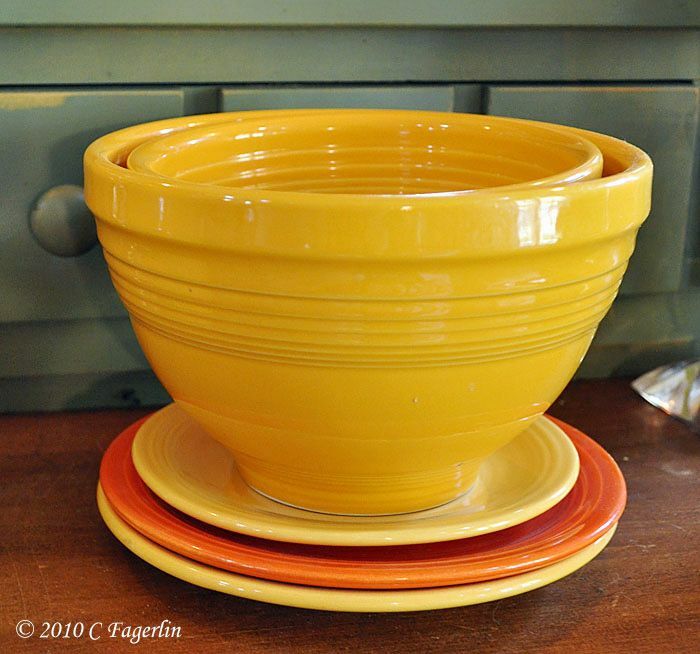 Nested "Prep Bowls" in Marigold. 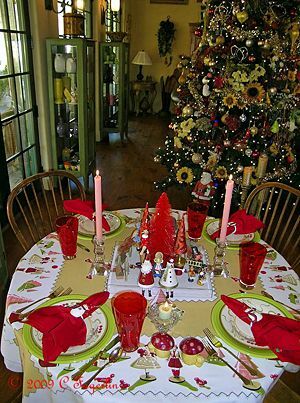 Happy holidays to all of you, I do hope you'll stop back later in the week for Tablescape Thursday's offering here on The Little Round Table and again Christmas Eve and Christmas Day for two additional tablescapes to top off this festive holiday season. Oh I love it. 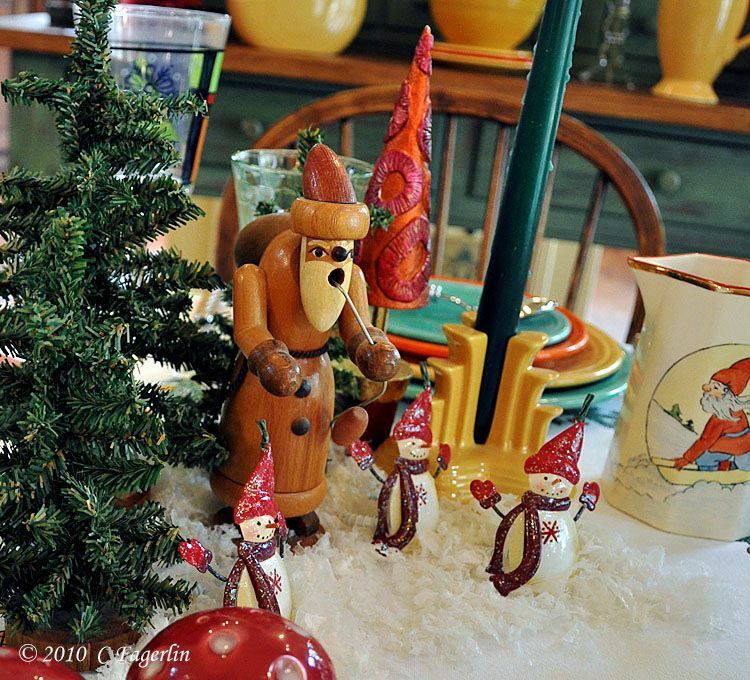 Your snowmen, angels and the little trees and then all the gorgeous dishes and other accessories. You always amaze me. I truly think this is perfect. 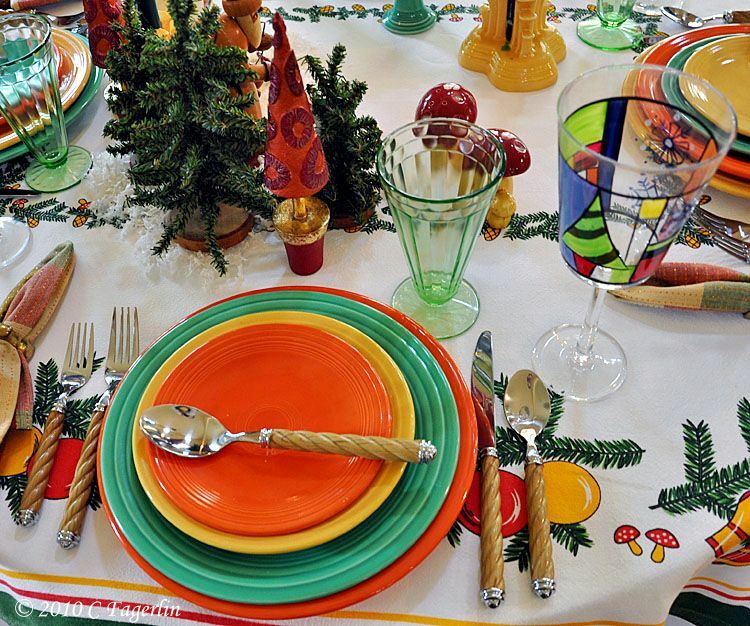 Hi Candy, Your tablescapes are ALWAYS PURE PERFECTION... 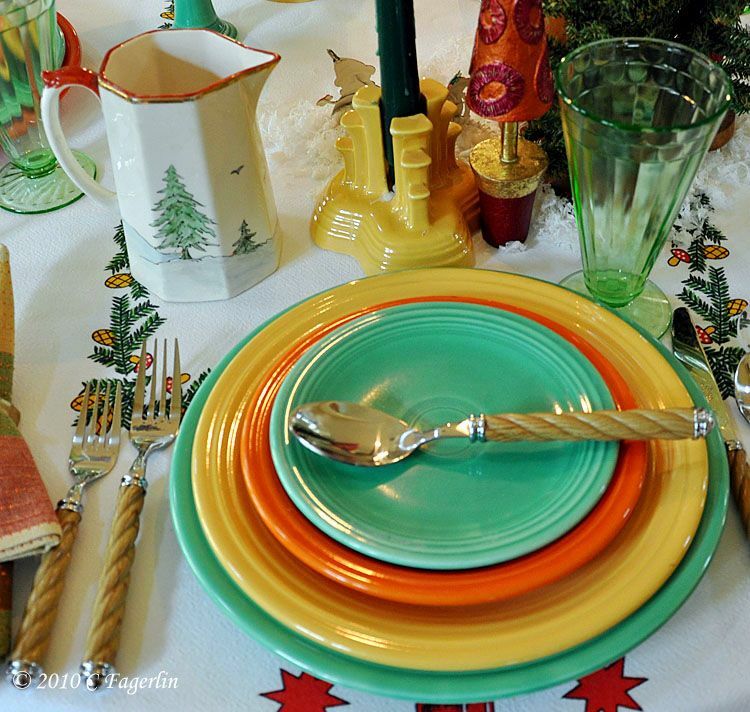 I do have a favorite thing here and that is the vintage Homer Laughlin mushrooms and pitcher... LOVE THEM, Oh my Ebay here I come!!! Gorgeous, Candy! 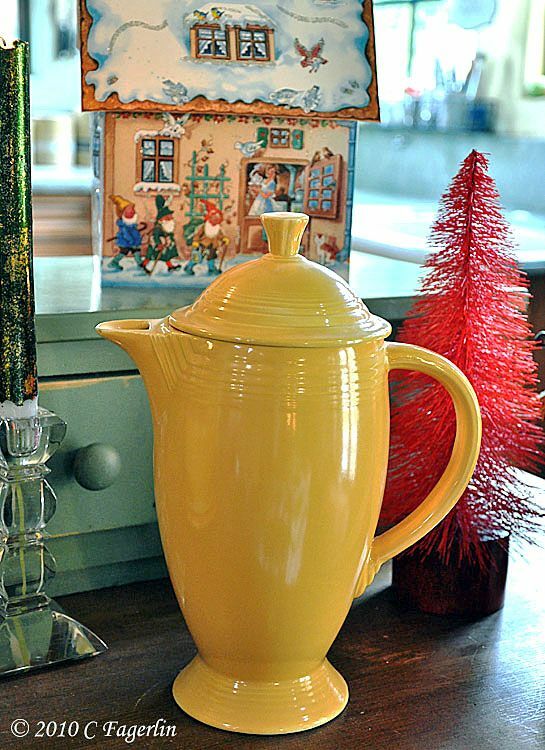 Love the coffee pot especially! great table as always. 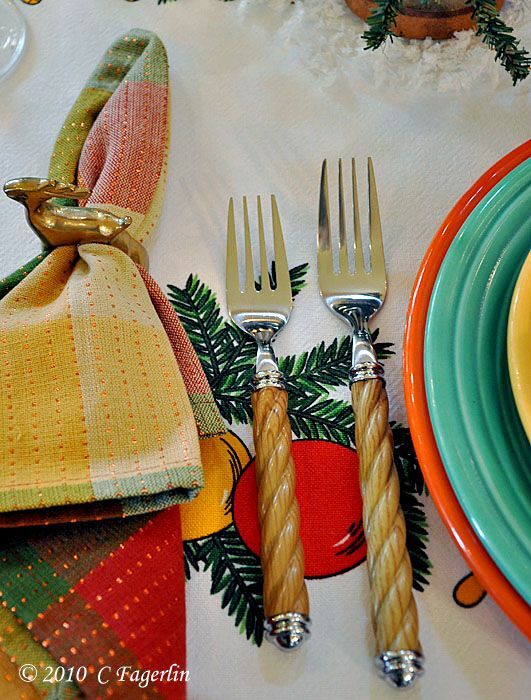 I really love the flatware with the wooden rope handle. 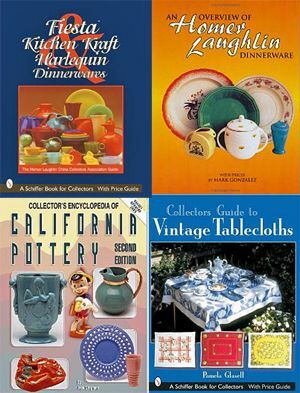 You have really an amazing stock of tableclothes. Hi Candy! 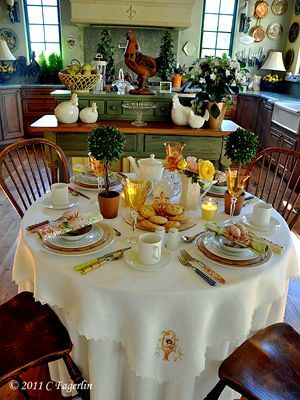 Your table looks fabulous as always. Wishing you and yours a blessed Christmas! 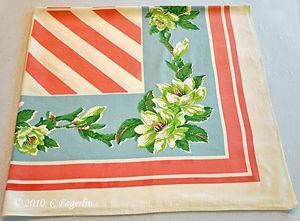 The colors on this cloth are just so crisp! It's the perfect background for the vintage colors. I love the woodland aspect of the 'scape...the little deer are just too cute! 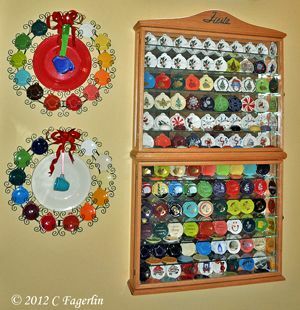 Your use and combination of colors is truely impressive...it is like a wonderland of design. Just breath-taking. Merry Christmas. 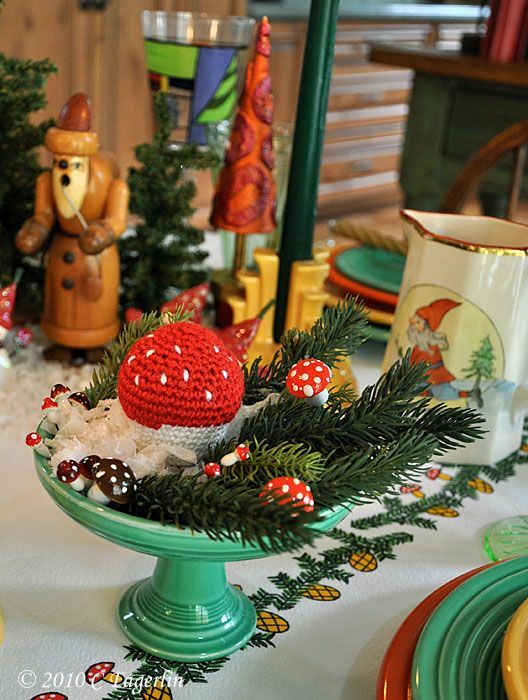 What a fun mixture of colors and mushrooms and snowmen and carolors. 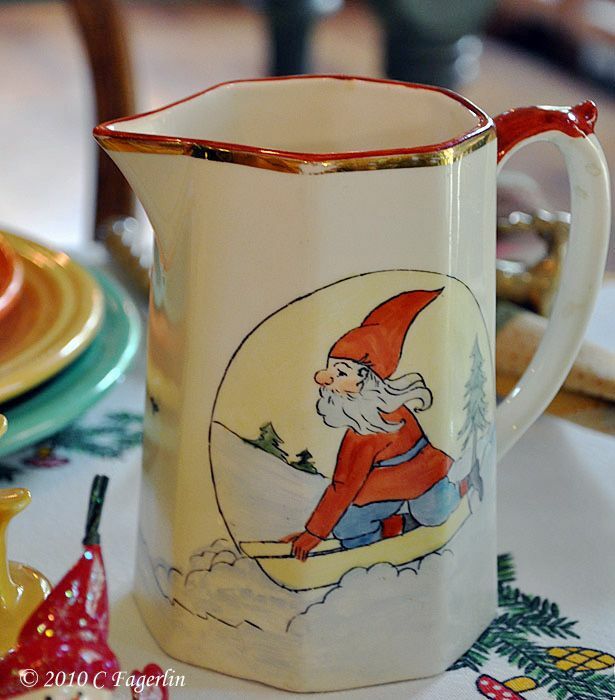 I always love your tablecloths -- and I especially love that pretty pitcher. 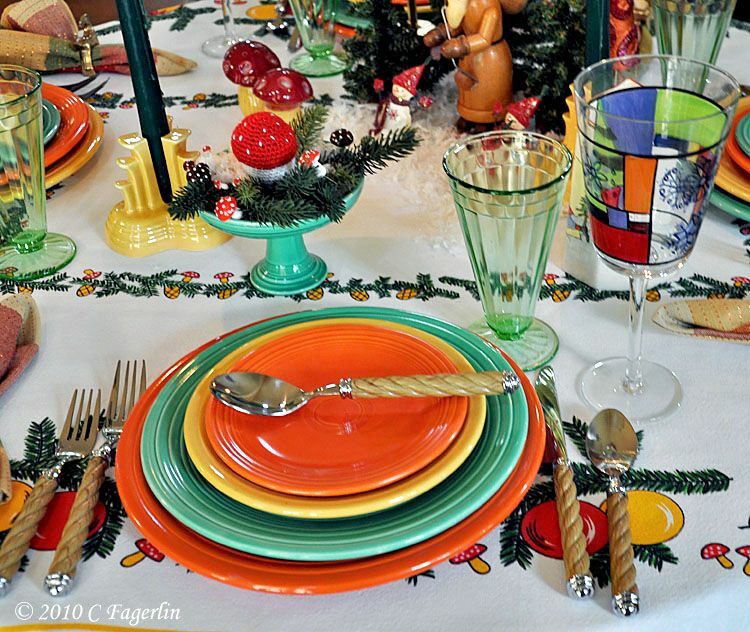 Thank you all for coming by to visit my tablescape! 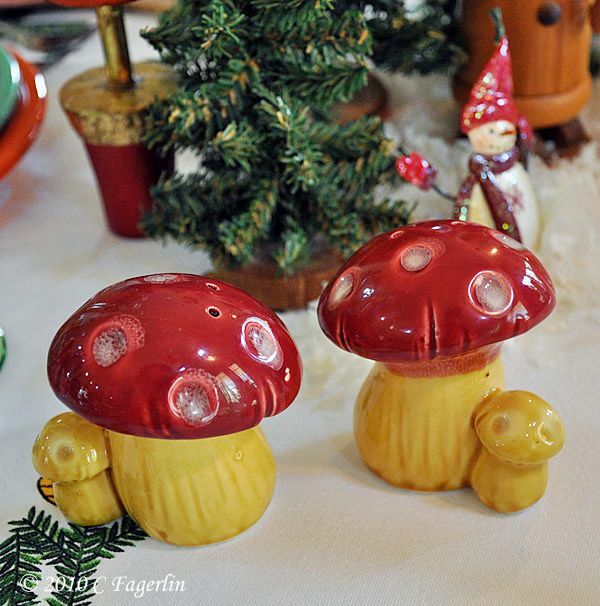 Just a note to Donna, the pitcher is Homer Laughlin, but the mushrooms are from an unknown maker! Pinky, the flatware is called Twisted Rope and I bought it on the internet. Let me see if I can find you a link. The name is "Royal Rope flatware", just enter that into Google and search away. I spent under $20 for each of the 4 sets I ordered. 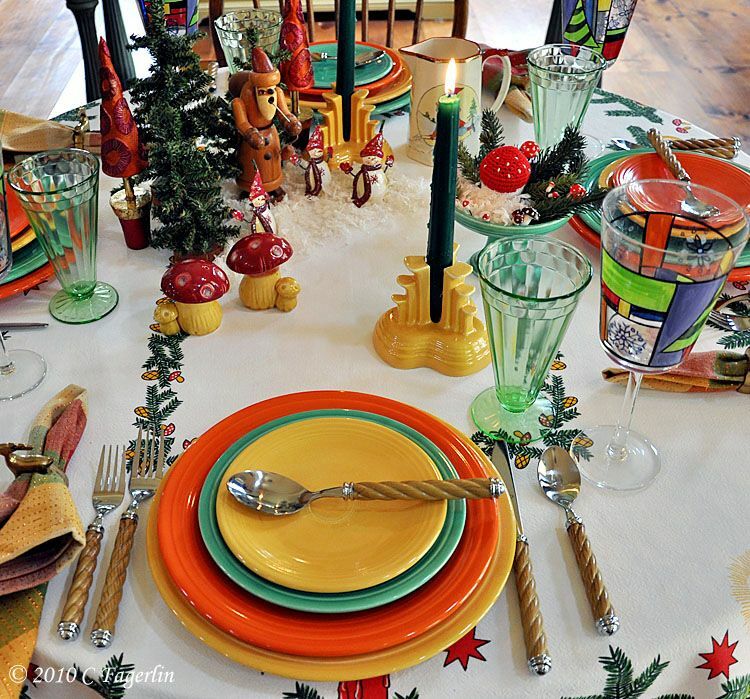 Candy, You set such a fun Christmas table. 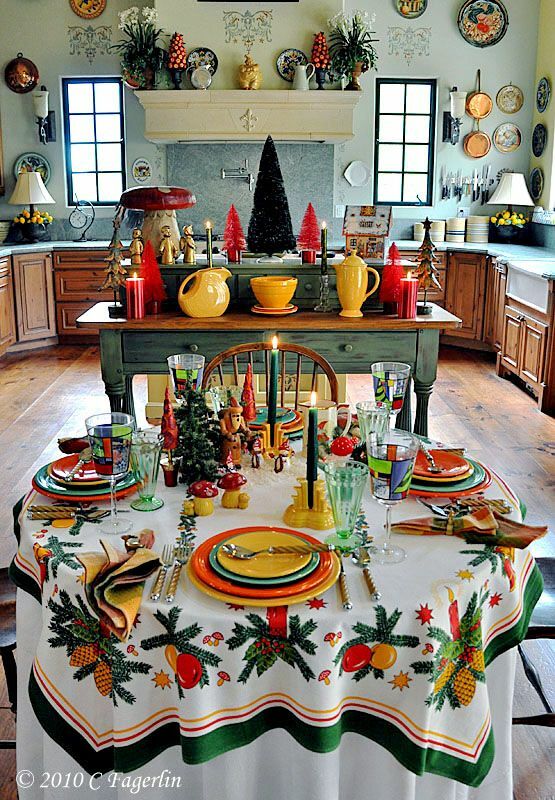 So different and festive using creative colors and non traditional elements. I just LOVE it!!!!! 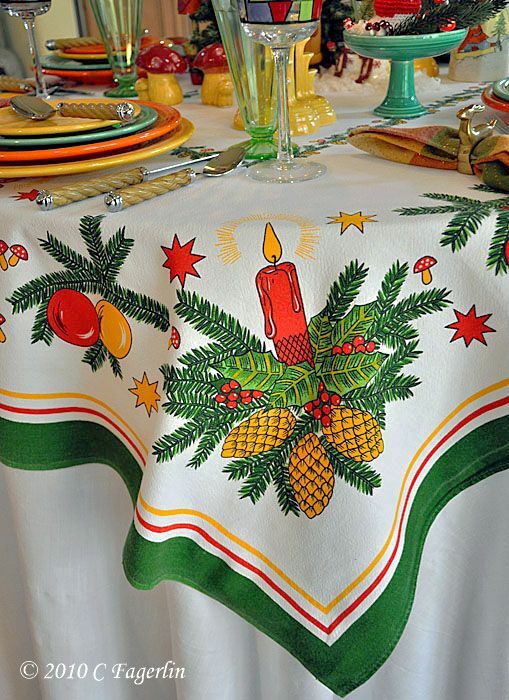 The tablecloth is fabulous and I can see where your inspiration came from. 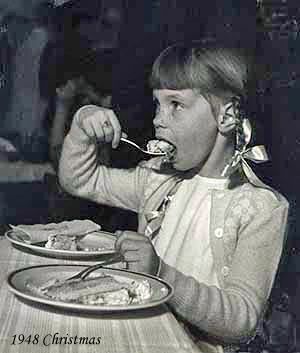 I too, love your flatware. Thank you for telling us where you got it. I would use a set of those! I'm so happy that you show your whole kitchen. 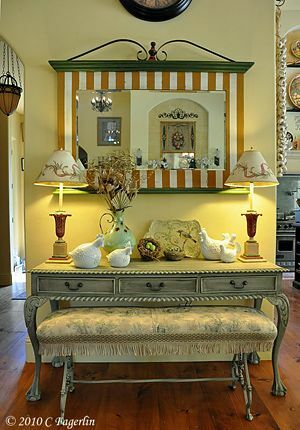 I am amazed with all of your decor! 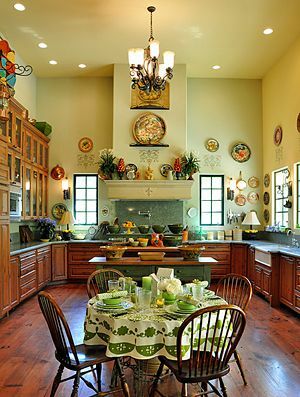 I could be very creative in a kitchen like that! 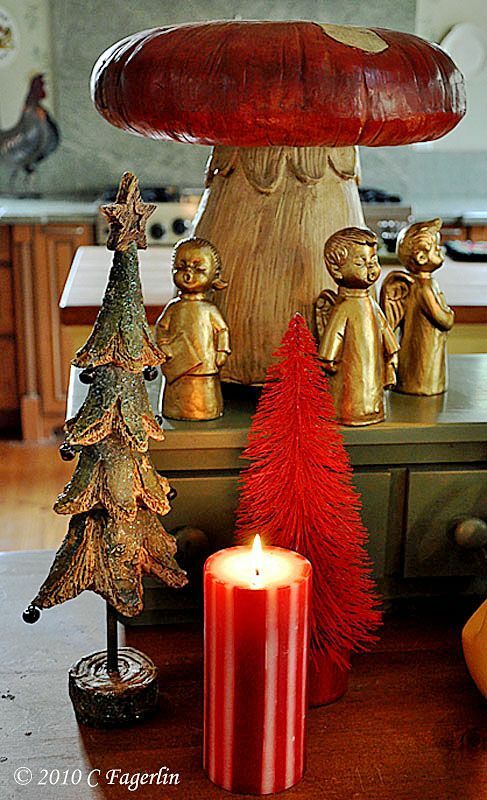 Blessings to you and all you love at Christmas! 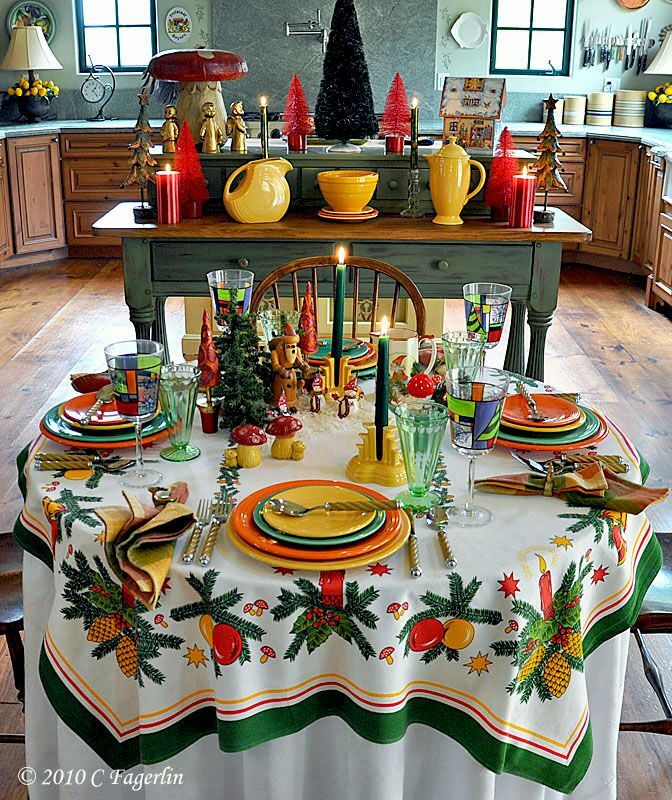 I'm with Yvonne's comments on this table, just beautiful and a step away from the traditional colors and settings. Thank you so much for sharing and Merry Christmas. Beautiful post! 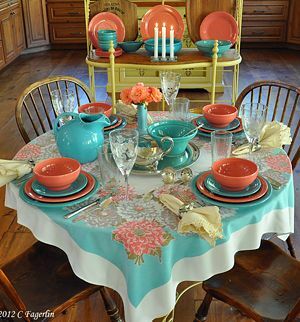 The colors on this table are stunning! 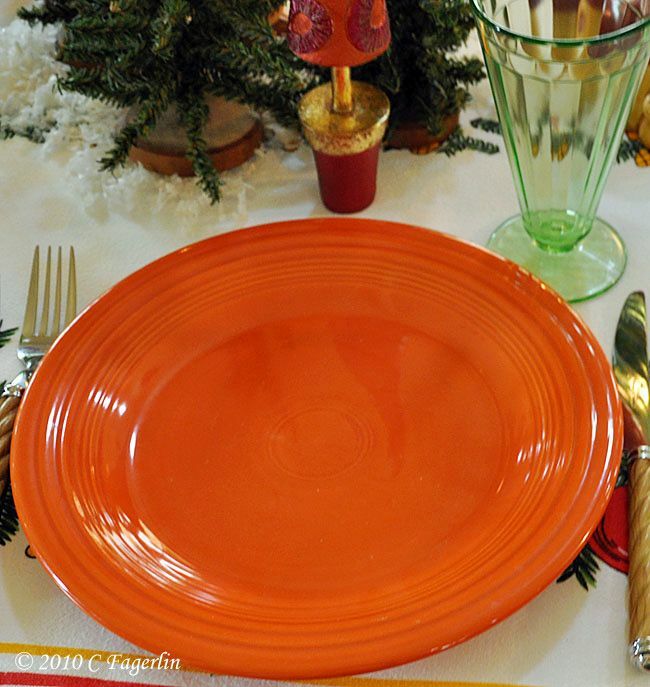 So different,but perfect for the holidays!! 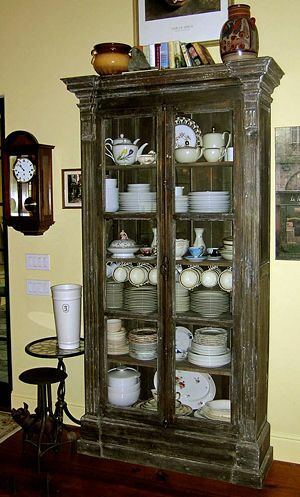 Your kitchen is beautiful, as always! Thanks for sharing. Happy TTT and Merry Christmas! So much fun! 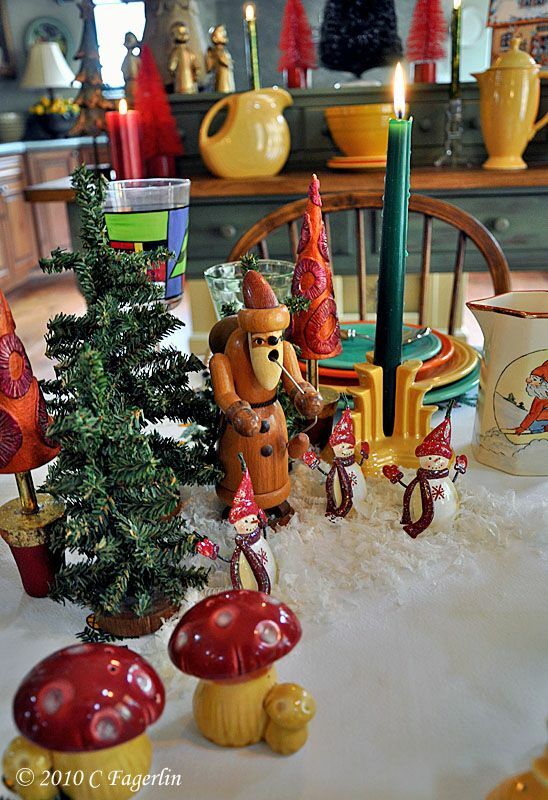 So festive and cheery and I love all your little gnomes and mushrooms! 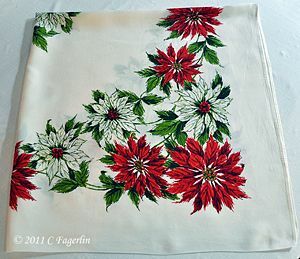 Wishing you a lovely Christmas and much joy in 2011! 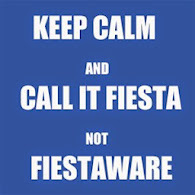 You just showed that it does not have to be red and green to be Christmas festive!! So cheerful! This is so merry and bright. It must make your food taste even more delicious. I like the pretty trees in your decor too. So festive! Everything looks so cheerful and happy. Merry Christmas! 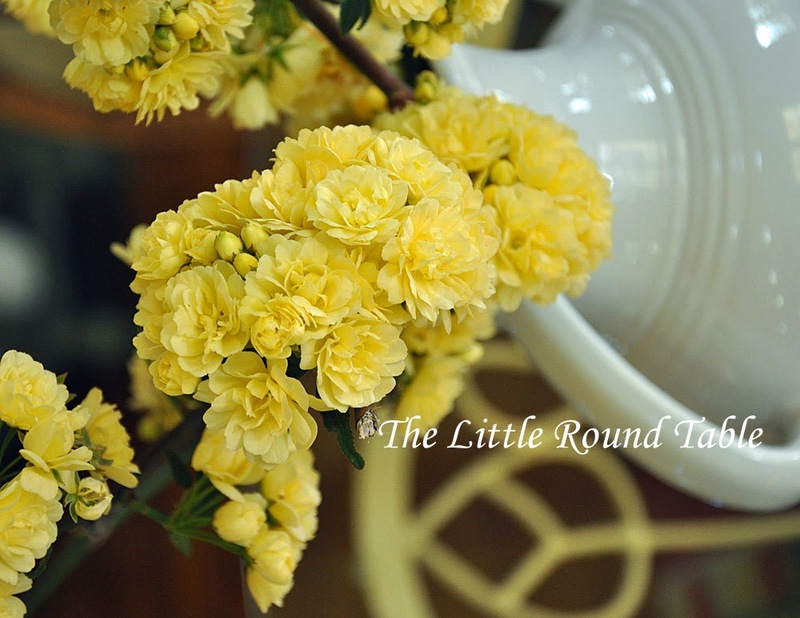 Thanks so much for stopping by The Little Round Table and leaving such lovely comments, I do appreciate them so much. 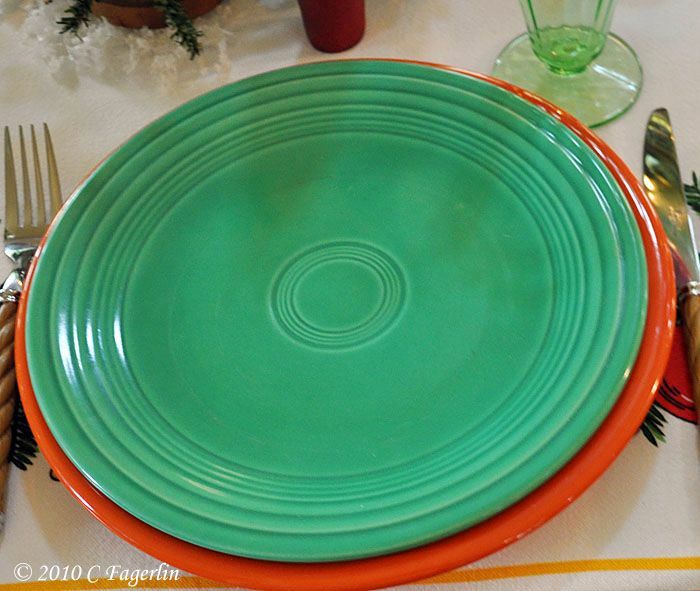 I love this color combo, not the typical red/green, but it still says "Christmas" to me. Candy...your tables are always AMAZING!! 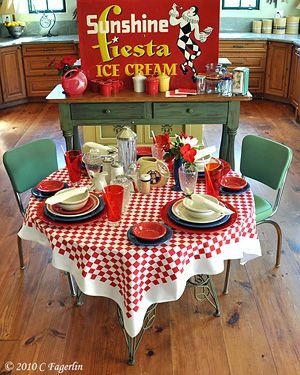 Love all the Fiesta and the colors are a bit unexpected for Christmas but work SO WELL! Amazing as always!! Merry Christmas. 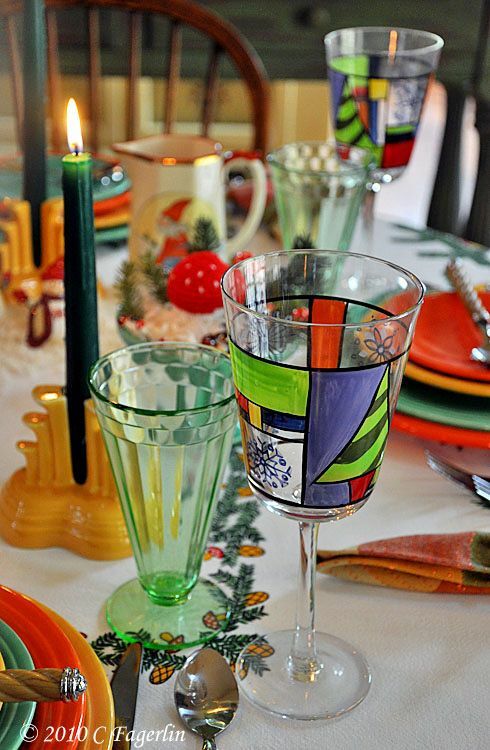 Thanks Gail and Anna, wishing you and yours the best of holiday seasons. Oh how beautiful! 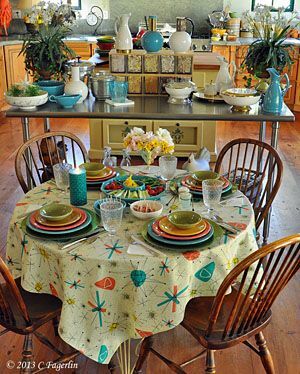 I love all the different colors you used and how they all work so well together and tie into the tablecloth so nicely! Your tables are always so lovely and I enjoy visiting you! Thank you Margie, I'm happy you were able to stop by!